I’m back. Back to public radio. As apt as that Al Pacino moment may seem in the context of going back to the realm of coffee mugs and pledge drives, my “return” is pretty exciting. I have accepted the position of General Manager for WBHM in Birmingham, Alabama. The people and the community impress me. It reminds me a bit of Pittsburgh – and WDUQ – in 1995. A city with a legacy in steel, evolving into a center for medicine, commerce, and education. The changing media world is offering up the potential for public media to take an even larger role in convening and informing the public. It is a great opportunity with a dedicated, talented staff in a special city with a great university, the University of Alabama at Birmingham, and a strong community of listeners and supporters. I am eager to contribute to the success of what is next. My radio career (or, should I say, my first paid radio job) started in September 1978. The same month and year as a TV show about the business, sort of. 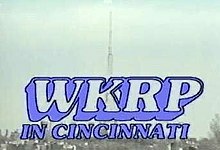 WKRP. And so it went for more than three decades. About a year and a half ago, I left not just public radio, but broadcasting as my full-time gig. Things had changed and moving on made sense. Things do end. Even good things. The past year and a half has been a fascinating experience, working with new groups of great and diverse people doing interesting and valuable work. Now, another hand has been dealt in the realm of radio. WBHM in Birmingham. I regret leaving the State Theatre in Uniontown before their hopes and ambitions for the 90th Anniversary Season are fully realized. It is a great organization on the rise, with a dedicated board, staff and volunteers, serving a remarkable community with a fascinating history. I will continue to support them – and encourage you to, too! (Season opens with the musical, Titanic – September 29, 2012 – call (724) 439-1360 to order tickets for that and many other great performances). To my friends in Pittsburgh, Uniontown, Michigan, Iowa, Texas and more, up and down the dial, I leave a bit of my heart with you. It has been a privilege to have had so many people and places welcome me home. See you on the radio in Birmingham! This entry was posted in NPR, Pittsburgh, State Theatre, UAB, Uniontown, WBHM, WDUQ, WKRP. Bookmark the permalink. 1 Response to ..they pull me back in.